This weeks Monday mani is a quick review/first impression. 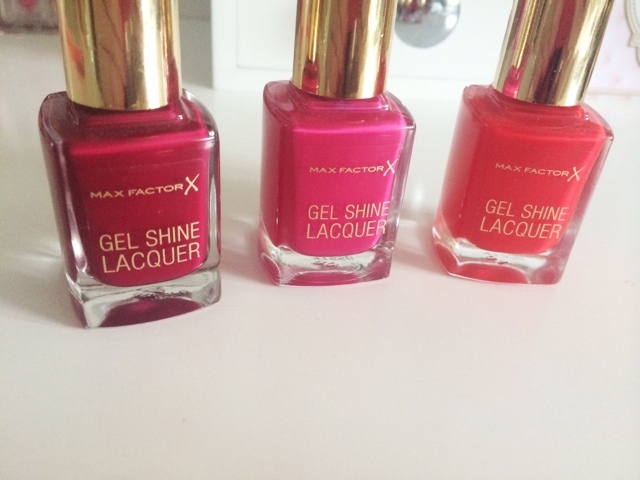 I picked up some of the Maxfactor Gel Shine Lacquers and wanted to share my thoughts with you, as this is the first time I've tried any polishes from the brand. These shades were my fave from the bunch, and swatch exactly the same colour as the pictures above. Only thing is there isn't a massive selection with there only being 9 shades. Of course, I needed another pink one but the others I thought would be perfect to transition into autumn. They are really easy to apply and they are opaque in one coat which is outstanding. Normally I put on another layer anyway but with these there really is no need, it's incredible. I'll be honest, the first day I wore Sparkling Pink it chipped within a few hours. I don't know if it was my fault for not putting two layers on or if it was because of what I was doing on that day (which I can't remember), but other than that they lasted reasonably well for a drugstore polish which costs £6.99. I was slightly disappointed though as a friend had told me they lasted really well and were the best in the drugstore. But I will still wear them a lot and maybe even pick up a few other shades for the colder months which are fast approaching. Application is fast and easy as the brush is the perfect size to get the whole nail in two measly moves and with Seche Vite on, you have a faux gel manicure in 10 minutes. Have you tried any of the Maxfactor Nail Polishes?